The following programs need the Matlab Compiler Runtime (MCR) to be installed. This little program is a very easy-to-use audio recorder (single button recorder). Push the button to start the record, push the same button to stop it. By default siburec stores the wave-files with the stoptime encoded by ISO 8601 appended to 'rec_' as the filename like 'rec-20120905T130513.wav'. But you also can enter a different path and filename. The audio examples of the program snrgroups further down here all are recorded by siburec. This program generates groups of CW-characters or digits or groups of English spoken digits. This gererated signal passes a radio-channel simulator with the options 'ideal', 'fading' (different coherence times), or 'aurora' (144 MHz). The received signal then is filtered at a user-chosen bandwidth. This program is well suited to test an operators ability of digging faint signals out of the noise. There is no user guide. But a simple help function is integrated. 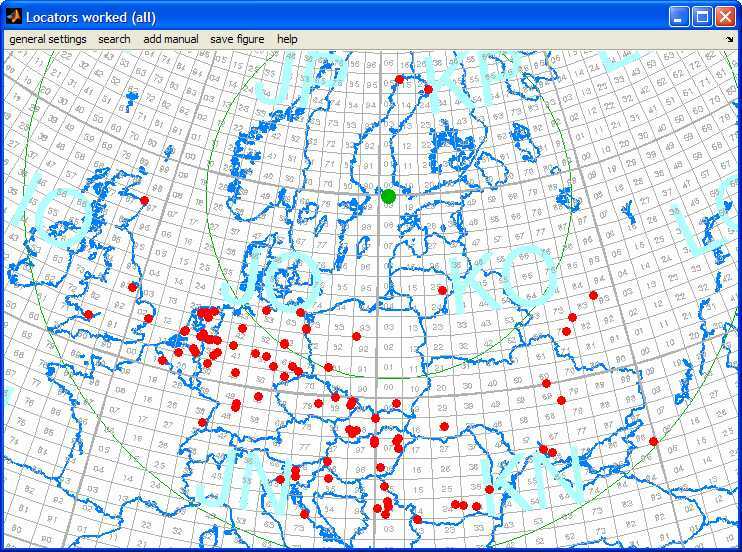 A program that generates a map with coast lines and locator grid and markers at all locators present in your ASCII log file. 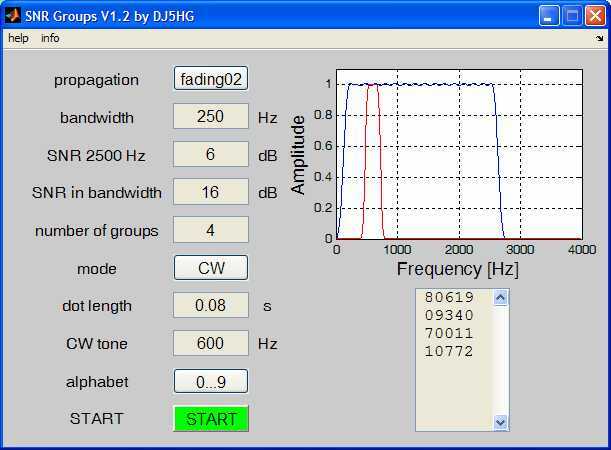 This program is intended to draw the results of VHF-work or higher. The search for worked locators can be restricted to those lines in the log file that contain additional entries like "2004" and "CW" or "2005-01-04". If you search for "Alex" you will get a map of locators of operators worked whos name or city starts with "Alex" or a comment contains that string. 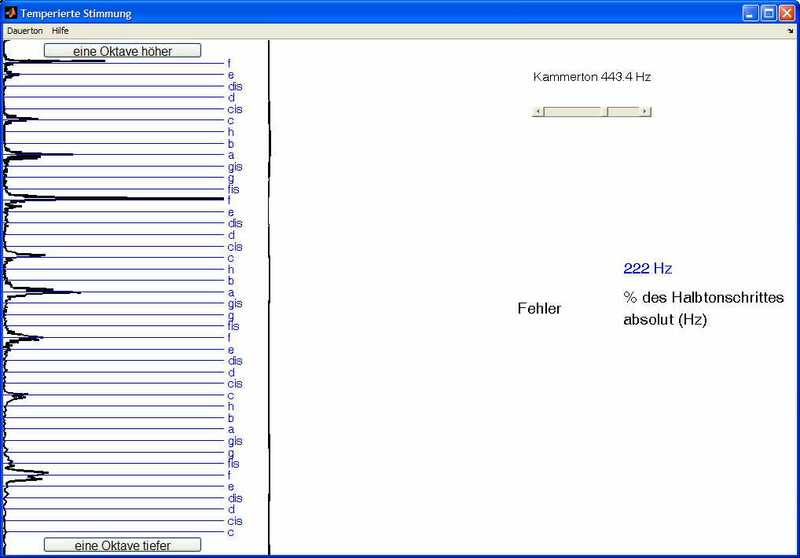 This program is a help for tuning music instruments. It was programmed within two hours long ago when it was needed in my family. Since then no improvements were made. Take it as it is with help and display in German. It displays the spectrum of the actual sound input. Clicking on one of the notes produces the corresponding tone on the sound output.